Dust collectors are a must for industries with dry particulates, and it is possible to use these systems with existing ductwork. Applied Conveyor Technology, Inc. (The ACT Group, Inc.) shares how to use misting systems and dust collectors with a properly designed airflow system. Ductwork in a dust collection system is like the blood vessels in a body or the freeway system in the USA. 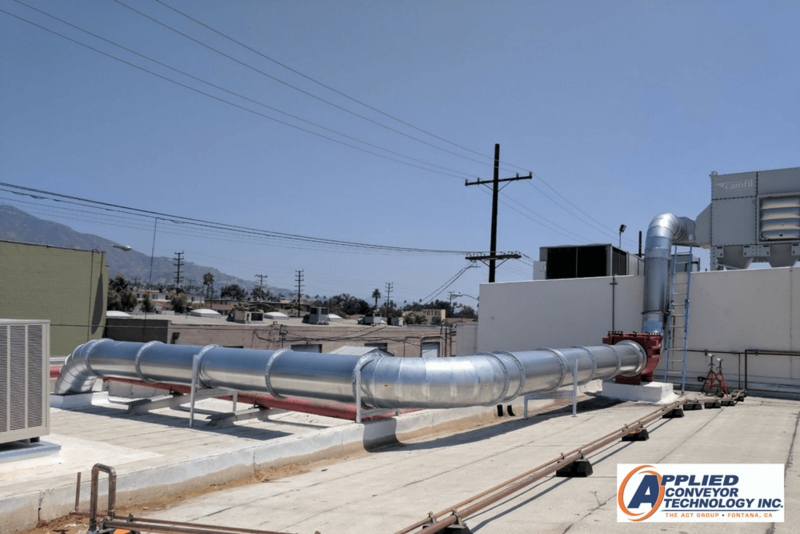 The ductwork allows the exhaust fan to pull dirty air away from areas in the facility and to the dust collectors, thereby allowing workers to breathe clean air. This airborne particulate collection also prevents equipment from accumulating dust and other airborne particles that can clog up functionality. Without a properly designed ductwork system, the dust collector may not provide the dust collection required. It can also pull too much, thereby capturing product and lowering yields. 1) One of the first things you should decide on is the use of dampers. If you going to use dampers, this means you will be adjusting the airflow or designing the ductwork to allow for the correct airflow. > Using dampers allow you to adjust airflow in the future. > If the existing airflow system is properly designed, no dampers will be required, but this also limits modifications of the system in the future. 2) Try to make the ductwork as straight as possible and minimize turns as much as possible. Every turn your ductwork has will increase the pressure drop of the system. Turns are also areas where particulate can build up, causing efficiency issues or dirty air. 3) Minimize the use of flexible ducting as much as possible. Flexible ducting has much higher friction than smooth ductwork. This increases the pressure drop required and could lower the airflow through the system. 4) When sizing the ductwork, you generally want it to be as large as will fit. The key is to have optimal performance with minimum air velocity to prevent the particulate from building up in the ductwork. Usually, a minimum air velocity between 3500 to 4000 FPM will keep particulate from falling out. However, heavier and larger particulate could be greater, while smaller and lighter particulate may be less. A key takeaway is that if the ductwork isn’t designed correctly, then the dust collector may not perform as you may want it. It’s also worth mentioning that your airflow system might not have anything to do with the actual dust collector’s performance. If during the process, you see issues, let your ACT Group, Inc. representative know. It is better to do it right the first time instead of trying to fix any issues, especially one that is not of your making. Contact The ACT Group, Inc. today to get a quote, or call us for assistance (888-480-0680).